Emperor Angelfish (Pomacanthus imperator), juvenile being cleaned by Cleaner Shrimp (Lysmata amboinensis). Found throughout the Indo-Pacific, including Great Barrier Reef, Australia. Photo taken at Tulamben, Bali, Indonesia. Within Coral Triangle. 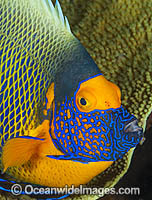 Blue Angelfish (Pomacanthus semicirculatus). Also known as Semi-circle Angelfish and Half-circled Angelfish. Found throughout Indo-West Pacific, including Great Barrier Reef, Australia. Geographical variations occur.